You'll find our newest collection of DIY craft kits in the Sewing Project Kits section of the store. Tote-n-Go Panel Projects from Fabric Editions make it easy to sew a modern & stylish handbag in less than 3 hours! 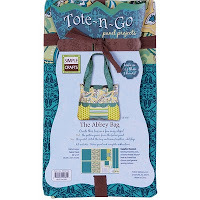 The Abbey Bag Sewing Kit is one of six new handbag sewing projects in the collection. 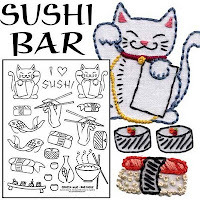 Kit includes a 100% cotton fabric panel with pattern pieces and complete instructions. No paper or tissue patterns required. The pattern pieces and step-by-step instructions are printed directly on the fabric panel. Simply cut out the pattern pieces and sew them together! The Abbey Bag is the perfect everyday handbag. Pair up with fashion jeans and a sweater for a casual modern look. Great for shopping or lunching with friends. Finished size is 12" x 15". The Larkin Bag Sewing Kit includes a 36" x 54" cotton fabric panel and complete instructions. This is one of the quilted handbag designs. After cutting out the pattern pieces, quilt the bag by following the printed design. Then, sew the pieces together! The Larkin Bag is a colorful tote bag design. 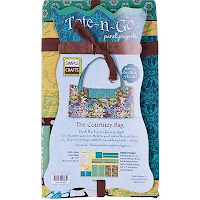 Ideal for toting books, magazines, or crafts. Or, use as an eco-friendly bag for grocery shopping or trips to the farmer's market. Finished size is 14" x 14". You'll need basic sewing supplies on hand to complete the Tote-n-Go Panel Projects, including a sewing machine, iron, scissors, thread, and general sewing notions. Some handbag styles require additional supplies, such as fusible fleece and/or heat-activated adhesive. Supply requirements are provided in the product description as well as on the product label. Fabric panel sewing kits are a quick & easy afternoon sewing project for experienced sewing crafters. They're also an ideal sewing kit for beginners looking for an easy-to-sew starter project. The Simplicity Classroom is an excellent sewing resource for beginners just learning to sew. You'll find helpful information on a variety of topics, including sewing basics, techniques, videos, free projects, and much more! 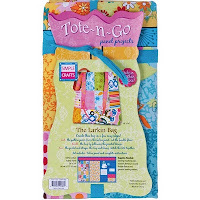 Stop by the Sewing Project Kits section to see the complete selection of Tote-no-Go handbag sewing kits. Sewing your own handbag has never been easier. DIY craft kits make being creative easy & fun! Visit Weekend Kits today and be ready to start sewing on your next Weekend at Home! It's never been easier to get started making beautiful beaded jewelry at home! The Jewelry Class in a Box! Kits from Cousin are complete jewelry making kits for beginners. These creative jewelry kits include the tools, materials, and instructions you need to make coordinated jewelry pieces. You'll find them in the Jewelry Kits section of the store. The Jewelry Class in a Box! - Perle Nouveau Kit includes everything a beginner needs to make a matching 3-piece set of jewelry. Kit includes a 3-in-1 jewelry tool, bead design board, crystal & gold flower pendant, glass beads, metal beads, seed beads, accent beads, gold findings, jewelry wire, and an instruction brochure. 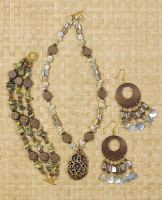 Coordinated jewelry set includes a gold & glass bracelet, gold flower earrings, and an 18-inch crystal & gold necklace! The 3-in-1 jewelry tool was designed for beginners to accomplish the basic jewelry making techniques. It combines round tips for forming loops, a flat gripping surface, and a sharp cutting edge for trimming wire. The flat surface is also used for bending wire and flattening crimp beads. The bead design board provides a convenient way to organize beads and findings while working on your jewelry design projects. Long channels make it easy to experiment with bead placement prior to stringing. 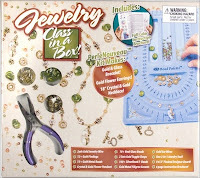 This is an ideal jewelry starter kit for beginners to learn to make their own jewelry. When you've completed your project, you'll have a coordinated jewelry set to wear again and again. The jewelry tool and design board can be used again for future jewelry projects. The Jewelry Class in a Box! - Elegant Naturals Kit includes the 3-in-1 jewelry tool, flocked design board, and supplies to make a 3-piece jewelry set. You'll have everything you need to make the 7" toggle bracelet, mother of pearl earrings, and 18" gemstone pendant necklace shown in the image at the left. The generous assortment of beads includes an elegant floral pendant, real gemstone chips, real shells, and mother of pearl accessories. A 6-page color instruction brochure helps guide you through the jewelry making process. All of the pieces in the Jewelry Class in a Box! Kits are professionally designed, taking the guesswork out of matching beads & findings for your first jewelry making project. Visit the Jewelry Kits section to see our complete selection of jewelry making kits for beginners. Weekend Kits offers a unique selection of creative project kits across a variety of craft categories. Stop by today and be ready to learn something new on your next Weekend at Home! Hand Embroidery Kits - Easy for Beginners! It's easy to learn how to hand embroider with kits that include everything you need to get started! Hand embroidery is as popular today as ever, with wide-ranging styles from traditional to modern, there's something for everyone. You won't want to miss our newest selection of embroidery kits for beginners. You'll find them in the Embroidery Kits section of the store! 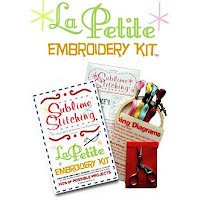 The La Petite Embroidery Kit from Sublime Stitching is a modern embroidery kit with the tools & supplies a beginner needs to start stitching with confidence! Kit includes a 4" embroidery hoop, embroidery needles, 7 colors of embroidery floss, embroidery scissors and more! This kit also includes complete instructions with clear, easy to understand stitch diagrams. You'll learn basic hand embroidery stitches, including split stitch, stem stitch, back stitch, and chain stitch. You'll also choose your favorite pack of Sublime Stitching Embroidery Patterns from our selection of 27 themes. There's an embroidery pattern pack for everyone! Choose from a variety of modern embroidery patterns, including Flower Power, Unicorn Believer, Camp Out, Krazy Kitchen, Sushi Bar (shown at the right), and many more! Each pack includes one 8-1/2 x 11" sheet of iron-on embroidery patterns with application instructions. These embroidery patterns are easy to apply and can be used multiple times. You'll need a foundation fabric or textile to embroider, such as a tea towel, apron, baby bib, or pillowcase. After transferring the pattern to your fabric, you simply stitch along the lines! This is a fun embroidery kit for beginners to learn how to to embroider. 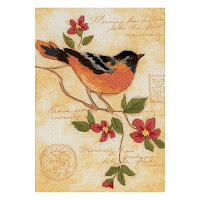 The Elegant Oriole Crewel Embroidery Kit is a mini hand embroidery kit from Dimensions. Kit includes wool yarn, embroidery floss, printed fabric, needle, and instructions. The foundation fabric is an ivory cotton homespun material printed with the background design shown in the image. The finished size is 5" x 7". The smaller design makes this is an easy crewel embroidery project to start & finish! You'll need some basic embroidery supplies to complete your crewel kit, including an embroidery hoop and a pair of scissors. Some optional, but very handy, supplies include a floss organizer and needle threader. You can find all of these supplies and more in the Embroidery Supplies section of the store. If you're a beginner, be sure to visit Sublime Stitching's How to Embroider page for an intro to embroidery and total beginner instructions. It's an excellent resource for anyone just getting started in hand embroidery. Visit the Embroidery Kits section to see our complete selection of hand embroidery kits for beginners and experienced stitchers. Professionally coordinated designs, materials, and instructions make kits the perfect choice for crafters with limited free time. Explore creative project kits across a variety of craft categories. Stop by Weekend Kits today and be ready be ready to create something new on your next Weekend at Home!